By the Power of Grayskull… I have the Power! And I'm not going to give it to Skeletor - he's back, possessed by an ancient evil and bedeviled by three malevolent creatures in Super7's retro-themed "The Curse of the Three Terrors" cartoon. To celebrate the retro pairing of Eternia and animation, Super7 created three new Mattel-inspired 5 1/2-inch action figures. 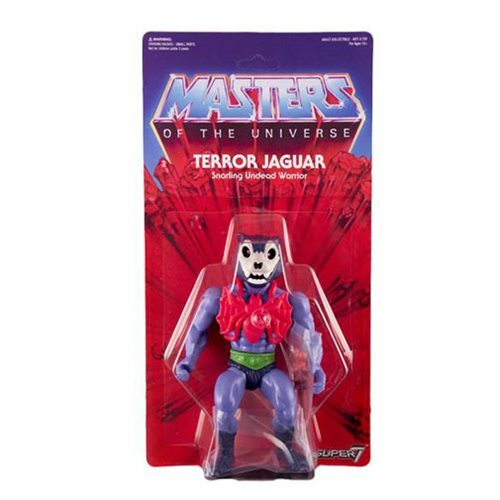 The Masters of the Universe Terror Jaguar Vintage Action Figure comes with a blue and green costume and with a red arachnid on his armor and blue skin. Ages 15 and up.